Uploading your activity images is the start of the fun part of your book. You can sort and separate on your computer first, or upload everything and separate in your Image Library. It's your choice. Don't feel like you need to upload ALL the images you or other staff members have taken. Some images are just too blurry or not specific enough. Keeping your Image Library "clean" will be a big benefit when your deadline comes around. Open the Image Library from Create > Image Library. Expand the image category (i.e. Activity or Portrait) and highlight the folder you wish to upload to. Click Upload above the thumbnail panel. 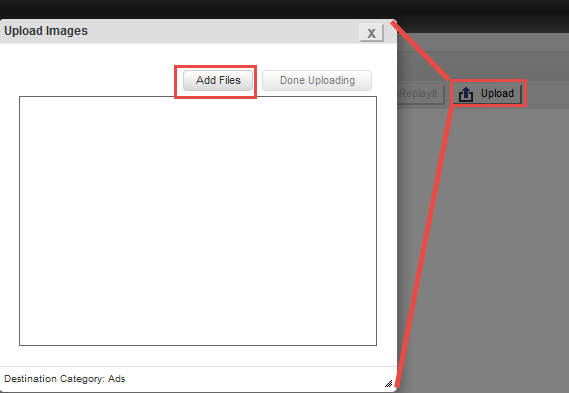 Click Add Files and choose which images to upload. The green bar shows your progress. Click Done Uploading to close the Upload Wizard or add more files to continue uploading. Where can I upload to? *Use Inbox Staff if you're uploading a group of mixed images and will sort them later. You'll need to move any Inbox Staff images to categories in order to use them on pages. Are there any image guidelines? .JPG, .TIF and .PNG files only. Minimum resolution is 300dpi or ppi. High resolution files recommended. If you are scanning photos, use 400–500 dpi. If you are using a digital camera, set it to the highest resolution setting. Maximum image size is 10,000 pixels x 10,000 pixels. RGB file format only (no CMYK). Do not alter the resolution of your image in a photo editing software program. Doing this may allow you to place an image in a larger photo box, but it may also result in a poor quality print. How do I use images on my pages? From Page Designer / Images button, find your category and then drag and drop. You'll need to move any Inbox Staff images to categories in order to use them on pages. Why does my upload take so long? The more images you select at one time, or the larger the image size, the longer it will take to upload. Upload speeds are about twice as long as download speeds. Your internet connection, antivirus software, or network filters can affect this. Can I upload Portrait images? If you have just a few Portraits, upload to Inbox Staff, drag the Portrait to the teacher / room / grade where the student belongs, and don't forget to add the student's name to the People tab when your upload is complete. If you have an entire portrait disc, send those to us for upload. consider setting up your ReplayIt account under Plan > ReplayIt so you and other parents can upload directly! Instructions will vary depending upon the device you're using. It's always best to search your device manufacturer's support documents or speak to your wireless company representative when retrieving or backing up images so that no data is lost. These folks are the experts when it comes to your specific device. TIP: Do you have a back up copy of your personal images somewhere other than your phone? Most phones allow you to back up to the cloud or have a program to back up to your computer.